Guavas are commonly called Amrood in Hindi, Peru in Marathi, Koiya Pazham in Tamil, Jaamapandu in Telugu, Nattu Peraka in Malayalam, SeebeKayi in Kannada, Jam phal in Gujarati, Amrud in Punjabi and Peyara in Bengali. Guavas are available all the year round In tropical regions. Different varieties of guava are available such as the Chinese Guava, Strawberry, Lemon, Apple and Mountain Guava. 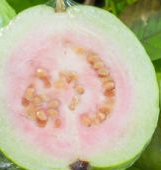 Some types of Guavas have red flesh are more nutritious than other guavas. 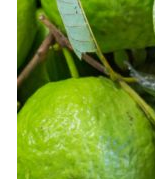 When the guava fruit ripens the skin of the guavas becomes light green to yellow and the guavas inner flesh softens and become fragrant and have a fruity aroma. Always while buying guavas choose fresh guavas which have their skins intact without any cuts, bruises or patches. The type of guavas you choose depends on the variety you are buying. When you are buying pink guavas you should choose the ones that are firm and do not have any soft spots. While buying white Thai guavas, always make sure that their skin should be bright green and are free from any type of blemishes or soft spots. You should avoid buying Guavas that are overly soft or the ones with soft spots or discoloration. You can store Guavas at room temperature for a few days. Unripe green guavas can last for 2 to 5 weeks when kept at a regulated temperature between 46F and 55F and relative humidity of 85% to 95%. To quickly ripen the guava you can keep it wrapped in a paper with a banana or apple. Fully ripe guavas can be kept in refrigerator for a few days. You can keep Ripe guavas in a plastic bag or container and refrigerate it for a few days. It is best to consume them within a day or two. Unripe guavas can be stored in a plastic container or bag and they can last for around two weeks. One can also choose to Freeze the guavas to make them last longer. To freeze a guava, cut it and place it in a freezer container. Cover it with light simple syrup and provide a little extra space in the container for expansion.